UTSA has 26 recognized religious student organizations. This is the premise for the 16 Apples Production documentary, “Religion in Rowdyland” released on YouTube in March. 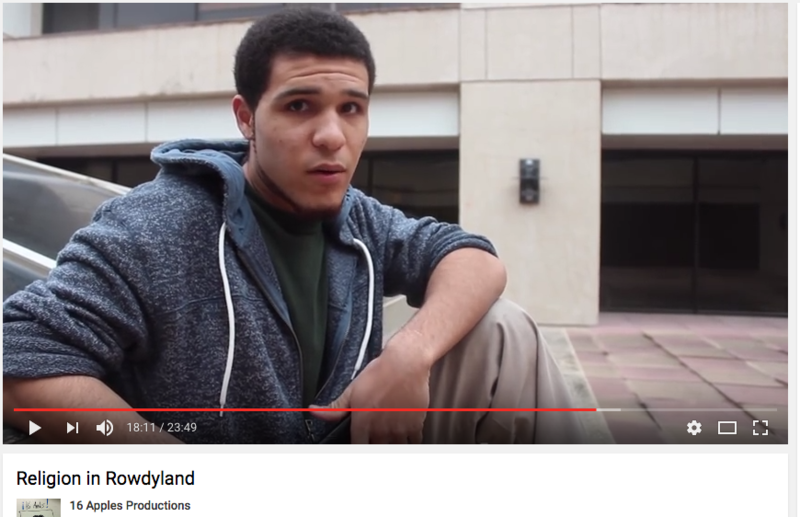 The UTSA student documentary is an attempt to explain religious phenomena at UTSA with limited bias and favoritism. The documentary was a passion project for creator, director and UTSA alumnus Lynnrae Smith. Smith’s inspiration for the documentary came from his study of psychology and observations of religious nature on campus. During his sophomore year of college Smith realized how devoted some religious people were to convincing other students to join their students religious groups. Smith knew he wanted to make “Religion in Rowdyland” after observing a classmate practicing street evangelism and preaching to passersby that the world was going to end and that they needed to repent. Since his sophomore year, Smith has expanded his knowledge in religion, sociology and psychology to make the documentary. According to the documentary, UTSA is one of the most religious universities in Texas. With 26,000 students as of Spring 2016 and 26 organizations, there are 1,000 students per one organization. This is the highest per capita in the state, and it rivals every school in the nation. 20 out of 26 religious organizations are Christian-based. Whether the organization is Methodist, Baptist, Catholic or nondenominational, all of these organizations practice evangelism; rather, the spreading of the Christian gospel by public preaching or personal witness. The documentary crew reached out to many different organizations. Some organizations turned the crew down, while other organizations did not get a chance to be included in the film. Smith and the documentary crew strongly encourage viewers to think about the film’s content and for viewers to form their own opinions on religious groups on campus. The documentary highlighted three religious organizations and spoke to the student presidents. Epic Movement is geared toward Asian-American students with similar cultures in order for the members to better understand one another. The goal of Epic Movement is to win over students to Christ through outreach. Baptist Student Ministry (BSM), is one of the student organizations that wishes to spread the Gospel. BSM is a fairly new organization focused on building a sense of community with its members so everyone feels welcome. BSM preaches openness and genuineness in order to live in a Christ-like way. The organization attempts to teach what Christianity has to offer to nonmembers, but not in a forceful way. They believe living in a Christ-like way should be naturally achieved through prayer. Secular Student Alliance (SSA) is a group of non-religious students willing to have open-minded conversations about religion. SSA gives a home to non-religious students who feel marginalized on campus due to the plethora of religious organizations. Every year, SSA holds an interfaith religious discussion panel in order to promote rational discourse, evidence-based decision making and positive interfaith communication and friendliness. SSA hosted its third annual Religious Forum on Thursday, Nov. 10. 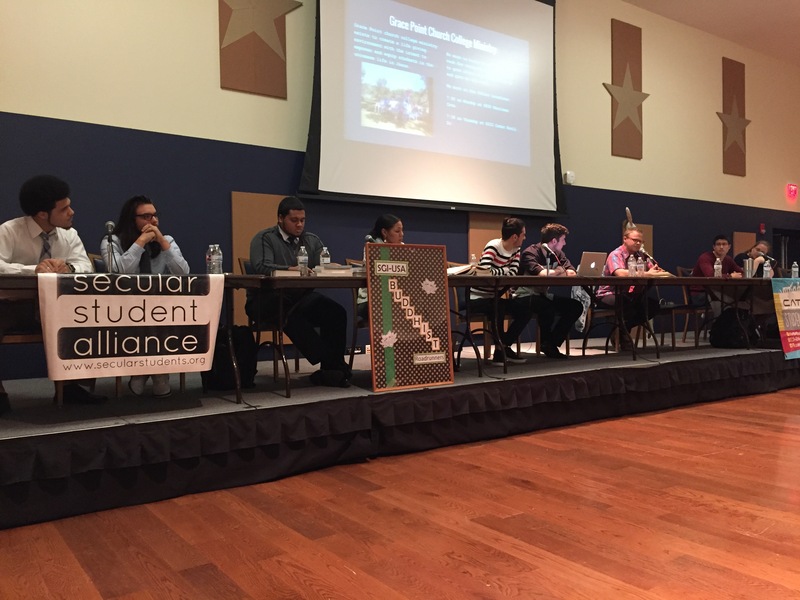 The Forum featured four UTSA belief-based organizations, such as the Catholic Student Association (CSA), Grace Point Church College Ministry (Baptist), Hillel (Judaism) and Soka Gakkai International-USA Buddhist Roadrunners (SGI-USA) while the SSA represented nonbelief. The annual forum works to encourage positive interfaith relations amongst growing tensions between religious and ethnic groups in the current political landscape. Each year’s Forum focuses on a theme. This year’s theme was love, which covered romance, dating and sexuality. Participants included Sean Rivera and Taylor Trevino, SSA president and vice president; Josef Gaudiesus and Naomi Gordon, SGI-USA president and vice president; William Chapel, Grace Point Church college ministry director; Moshe Lasky and Jasper Klein, Hillel membership & committee chair and religious & cultural chair; Daniel Oubre and Florencia Silva Cabrera, CSA president and director of campus ministry. The panel participants were asked a series of six pre-approved questions pertaining to romance, dating and sexuality. The floor was then opened up for a Q&A portion. The audience was asked to acknowledge that each panelist hold his or her beliefs sincerely by not asking loaded questions and not personally attacking the panelists’ beliefs. Both the forum and “Religion in Rowdyland” promote open-minded and polite interfaith discussion, while allowing individuals to build bridges and challenge the mindsets of those promoting conflict. As stated in “Religion in Rowdyland,” “Anyone can find a community and be accepted at UTSA,” regardless of religious belief or nonbelief. A sense of community and acceptance is especially important amongst the escalating tensions of today’s society. Concerts vs. music festivals: Which do you prefer?